to be a known and acknowledged carrier and developer of spa traditions in the Baltic Sea region as well as a preferable destination to spend a healthy holiday in Estonia. 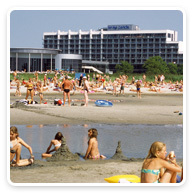 Tervise Paradiis is a spa hotel**** and water park opened in 2004 in the beach area in Pärnu. You are welcome to enjoy elevating spa relaxations and healing spa treatment procedures in our establishment. In addition to different types of massages, hydrotherapy and heat therapy we also offer relaxation in a salt chamber and in a health capsule. MatiSpa and other types of body care will give you a truly special treat. The packages in Tervise Paradiis have been compiled with a view to varied wishes. Our aim is to make your stay with us as relaxing and as healing as possible. You are also welcome to set up your own package by combining the accommodation and services we offer! In order to do this, we kindly ask you to contact our Sales Department. We also ask you to reserve the time of the procedures included in your package in the spa reception in advance! We welcome you to Tervise Paradiis to enjoy our services!